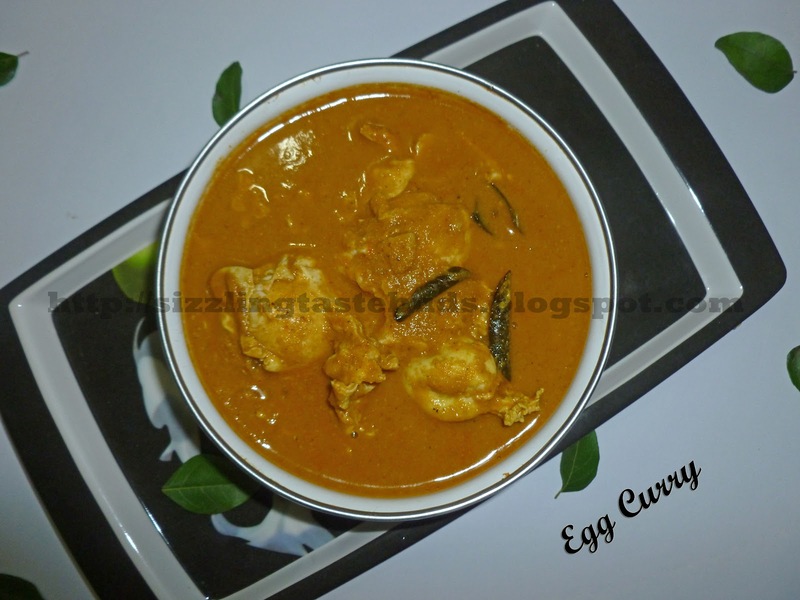 Egg Curry(Motte Saaru) is a lip smacking dish with goes well with Hot steamed Rice or dosa's. I remember a muslim friend of my mom during my childhood days who used to prepare delicious non-vegetarian food and would never miss to parcel some for us. Years later just before my marriage, I met her again and she was still the same kind lady I knew. She handed over me some of her best recipes like Chicken Biryani and this simple Egg Curry. I tried later one day, may be it was my first attempt to prepare a non-veg curry when mom was out of town. It was great. My father loved it so much and still demands for this delicious Egg curry on his visit here. Whenever I prepare this curry, I remember that aunt. Thank you aunty for this. 1. Make a fine paste of all the ingredients mentioned above in a blender except Potatoes, one onion, Curry leaves and Eggs. 2. Heat a kadai with 2 tsp oil and add 1 chopped Onions and curry leaves. Fry till onions turns slightly golden in color. 3. Pour the prepared coconut paste to this and add water depending on the desired gravy consistency. Add Salt to taste. 4. When this comes to an initial boil, drop in the eggs and some boiled potatoes cubes. Don't disturb the gravy and overlap the eggs while dropping them into the gravy. Close the lid and simmer the stove. Let eggs get cooked and absorb all the flavors of the curry. Cook for another 8-10 mins and then switch off the stove. 5. Slightly mix the gravy without breaking/mashing the eggs, and close the lid again. Eggs will completely be cooked with the gravy heat. 6. Enjoy it with Hot steamed rice or Dosa's. 1. Either you can drop the eggs directly to the gravy or use the boiled eggs cut into halves. 2. Better to break each egg in a small bowl and then drop it into the gravy one by one so that you can discard the rotten eggs and save your curry. Am sure this is lip smacking.!!!! yum yum yum..
Yumm, finger licking egg curry,loving this irresistible curry.